Product prices and availability are accurate as of 2019-04-16 05:32:48 EDT and are subject to change. Any price and availability information displayed on http://www.amazon.com/ at the time of purchase will apply to the purchase of this product. Neonetics LED signs are very bright! They feature 100,000 hour rated LED lights that can either be switched all on, or switched to a "running" feature, where the lights will move. 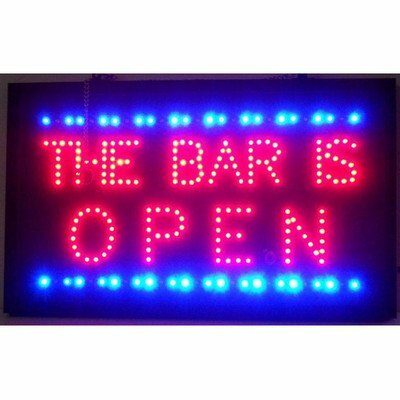 Our LED signs come equipped with a Plexiglas cover to keep the dust off the LED bulbs. These signs can be hung in a window or on a wall - just hang them up and plug in the included AC adapter, and you're ready to go! Neonetics offers hundreds of neon products, including official licensed products from General Motors, Ford, Mopar, Chrysler, Budweiser, Coca-Cola and Texaco. Their extensive collection of neon signs, neon clocks, neon sculptures and lighted pictures are given a colorful edge with real hand crafted neon tubes and L.E.D. accents. Committed to excellence and customer satisfaction, Neonetics innovative and creative products keep them at the top of the lighting industry. Since 1989, they continue to be focused on bringing the fun of real neon into your home or business.